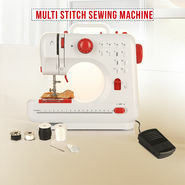 Sewing machines are always in the smashing hit list of truly handy products. And gradually, these tools have earned immense popularity from the masses. In the past decade. they have seen so many alterations in their manufacturing styles. The first ever made large sized stitching machine especially designed for home usages. So. they were not likely to be portable. Today, almost every popular brand has a product category of quality stitching tools and that too within every individual's pocket capacity. Those who are fond of stitching arts will surely be happy owning one best in class Sewing Machine. Thus, they do not need to shell out much money and can carry on their art work without any trouble. For a novice, these machines usually come up with basic stitching styles and less complexity, As good things do come in tiny packages, so a mini and compact stitching tool is way better for every situation. They not only meet the exact needs of the purchasers but also facilitate them with portability and affordability sides. A great good variety is there in this particular category in every brand's catalogue, You just have to choose the perfect one keeping your most wanted generic and dream features in your mind, Even there are fully computerized, electric and cordless stitching tools available in the market. In the whole host of silai machines you can find many models packed with versatile functionalities. Chalk out the stitching master arts you generally do and then select your stitching kit. 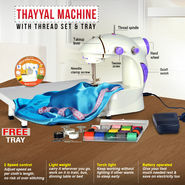 If you are professional tailor and need a machine that can stitch clothes- then a stitching unit with "free arm" facility will do the right job for you. 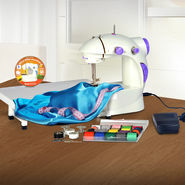 Likewise, for basic stitches, quilting and upholstery there are different stitching machines. The cost of these amazing tools depends upon the stitching styles and modern day technologies used in them. Some of them even show the process of pro like stitching with their little LED displays.